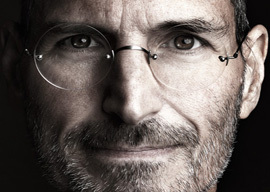 Much ink and pixelated type have been spent this week eulogizing Apple founder Steve Jobs. The outpouring of respect, gratitude, and sadness reflect the measure of the man more than most celebrity deaths. Steve Jobs was one of those rare humans admired across our common divides, as the adjectives acknowledge: visionary, artist, entrepreneur, revolutionary, idealist, capitalist, innovator, genius. People of diverse cultures and political affiliations enjoyed his products in equal measure. He created technologies that consumers never imagined they’d want or need, and they became indispensable to our lives in amazingly short time periods. But for all his success, Jobs had never completed college. The first time he found himself at a college graduation was in 2005 when he gave Stanford’s commencement address, noteworthy for its brevity as well as its message. He didn’t dwell on all the wonderful things those graduates gained by going to college, nor did he tell them to go out and change the world. Instead, he reminded them that life is short and if they lived every day as though it was the last, they could accomplish much. He also emphasized continual learning and relayed his own experience about a calligraphy class he’d taken before dropping out of Reed College. A good portion of his address was spent on how calligraphy changed his life. Calligraphy? It was here that Jobs developed a respect for aesthetically pleasing fonts, noting sizes and shapes, the amount of space between different letter combinations, and serif versus sans-serif typefaces. (Serifs are those small lines that finish off a letter with a flourishing little swoosh!) He didn’t think much about this until a few years later when he and Steve Wozniak were designing the first Apple computers, which employed beautiful typography. Up to then, computer typography was purely functional and certainly didn’t approach anything aesthetically pleasing. Because of Jobs’s attention to this detail, Apple computers came with multiple typefaces. Windows (mimicking Apple) followed suit, and today reading off a screen can be just as pleasing to the eye if not more so than ink on paper. This human touch represents Apple products’ desirability, from the use of materials to ergonomics. His primary message to the graduates: Connect the dots of your life and do what you love. There’s little in Jobs’s biography to suggest he was motivated by a desire to become rich. While he undoubtedly wanted to make a profit and enjoyed wealth as much as anyone, there’s no evidence he wanted to be rich just for the sake of being rich. What he wanted to do was make a better product—the kind of product he himself would like to have, and he was the one who could do it.